How do I allocate CloudExtend Gmail, Calendar or Google Drive licenses to End users? Typically a NetSuite Admin will allocate licenses since their role is highly privileged and requires no special setup. In the event that an organization wishes to delegate license allocation to a lesser privileged role the following permissions are required. The deployments for the following scripts (all from bundle 20497) need to have full permission enabled for the newly desired role. 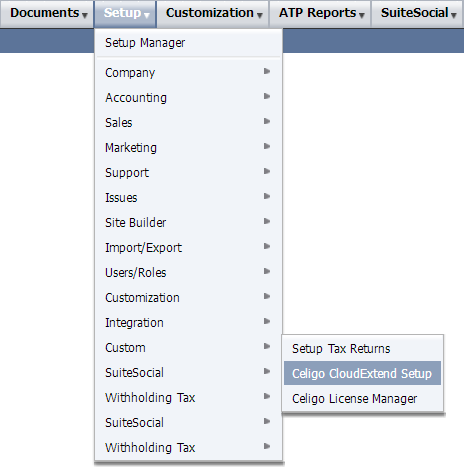 Step 1: Launch Celigo CloudExtend for G SuiteSetup in NetSuite Setup > Custom > Celigo CloudExtend Setup Wizard. Congratulations! You are done. Click Finish to go back to NetSuite. All End users who have been allocated a license will receive an email from Celigo with instructions on downloading the extension from the Chrome Store.